Today the Orange Squeezer compressor by Dan Armstrong is an almost legendardy guitar effect. An essential portion of this fame is probably due to the fact that it is often named as an ingredient for the early Mark Knopfler / Dire Straits sound. 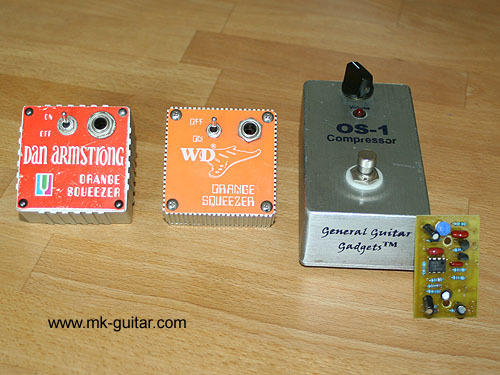 Ironically this goes back to my old Dire Straits Guitar Page which was the first site in the web to mention the Orange Squeezer as part of the MK gear, so today it should be up to me again to clarify what is really sure and what is rumour. What is sure, what is rumour? First of all, there is no clear evidence that Mark Knopfler really used one of theses on any DS or MK album. 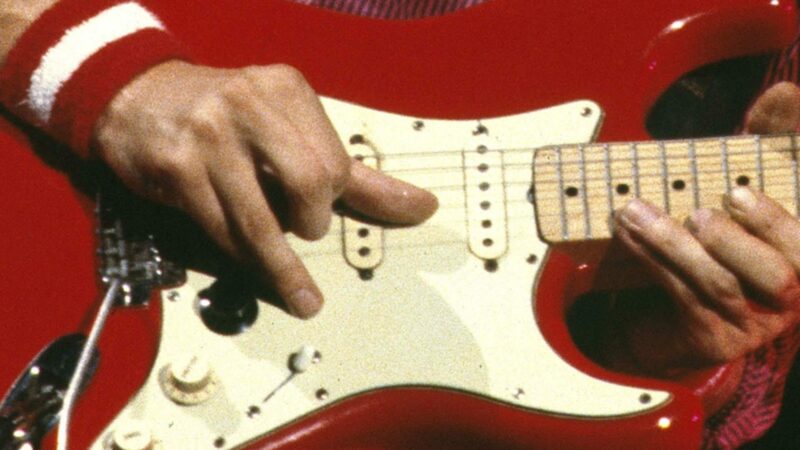 The first hint however I got was from Andy Brauer’s column in I think Guitar Player magazine in the late 80ies where he claimed that Knopfler’s famous Stratocaster sounds were achieved with an Orange Squeezer and an Aphex Exciter. He didn’t give a source for this information, but I meanwhile know that he worked for Mark Knopfler when he was recording Randy Newman’s Land of Dream album (Andy runs a shop for amp repair and gear rental in the Los Angeles area, his article did not clearly state whether the Orange Squeezer was used on the Randy Newman session, or on the first Dire Straits albums, or is generally a part of Knopfler’s gear). Source number two is the official tour program book of the Communique tour. It features an equipment list, and the last item in this list is the Orange Squeezer. However, this list was not specified for the tour or any particular album, it just said “Mark Knopfler plays…” Strangely Klaus Dewes, the author of a German book about Dire Straits published in 1980, also included the same equipment list in his book, but this time without the Orange Squeezer! Thirdly, I once asked David Knopfler about it who mailed me that he believes they had one, but he didn’t remember for what or when it was ever used. Conclusion: it seems likely that the Orange Squeezer was part of the gear, but noone knows any details. Anyway, so what exactly is the Orange Squeezer? Dan Armstrong developed a whole series of guitar effects in the 70ies. All of these were little coloured boxes with a plug to put it directly into the guitar output jack (after swapping two internal cables they could also be pluuged on the amp side, what makes more sense with a Strat because they don’t fit into the Strat’s recessed output jack). There was the Blue Clipper (fuzz), Green Ringer (an octaver), Yellow Humper (boost of certain frequencies), Red Ranger (booster, tone modifier), Purple Peaker (boost of certain frequencies), and of course the Orange Squeezer. The Orange Squeezer compresses the dynamics of the music or of the individual notes without adversely affecting the attack of the note and without adding any significant noise or distortion to the signal. An internal adjustment lets the user adjust the output level to suit his instrument and his playing style, while the compression threshold is pre-set at the factory. The compression is rather subtle, it is difficult to get heavily compressed sounds with a Strat (which has a rather low output, the louder your guitar, the more compression you will automatically get). However, some early Dire Straits songs – such as Down to the Waterline, In the Gallery, or Lady Writer – feature guitar sounds with much compression. The only way I found to get this amount of compression from the Orange Squeezer is to use some booster before it in the signal chain. Of course it is still possible that Knopfler used one on these songs, and that more compression was added with outboard gear, which is from the mixing desk (and it is also possible that all compression was done alone during mixing). There is another aspect to consider: compression – even a slight compression as from the orange Squeezer – can avoid a lot of distortion from the guitar amp. This is because louder signales – for example when you play two or three notes together instead of a single note – are compressed more, which means lower in volume. For this reason the amp distorts less on these notes. Have you ever noticed that many early Dire Straits guitar sounds are not that ultra-clean as most people think? In fact there is often a good deal of subtle distortion, e.g. on Down to the Waterline, Southbound Again, but also on Sultans of Swing. But what happens when you try to adjust your amp to such an amount of distortion – without using a compressor? Well, when it sounds right for single notes, it automatically distorts too much when playing more than one string, you will loose that clean sound. With compression it is different, you can adjust the amp to a warm subtle distortion, but the sound remains rather clean and Knopfler like no matter what you play. Try it out! This behaviour can be considered as another hint that in fact a compressor was used before the amp, which means as a guitar effect instead of outboard gear during mixing. An original Orange Squeezer from the 70ies is hard to get, and prices went up during the last decades (I am sure partly thanks to me). In the 90ies a company called WD offered a first OS clone which I bought and still have. Unfortunately they did not copy the circuit with 100% accuracy, so their copy sounds somewhat different (brighter, but still great because it has a warm sound with that nice little punch that any compressor adds). Later there was a flood of companies who copied it (the original circuit is really simple, even a good start for any DIY newby). I also got one from General Guitar Gadgets later but for some reason I don’t like this one that much. It doesn’t sound that “open” to me, hard to explain in words. A few years later I managed to get an original vintage Orange Squeezer on ebay, and in fact this one sounds the best. The GGG clone was built into a floor stomp box by the way and had the volume control on the outside, which was very handy. I built the original circuit into this box and this combination is what I still use a lot. Finally, a sound clip can say more than a thousand words, so listen to the following sound clip to hear the Squeezer in action. I demonstrate the aspects explained in this article, the last few minutes is me jamming on some Mark Knopfler tunes. Really a great article!! Very interesting indeed, thanks a lot! I’d really like to try that out, actually. You said in your article it is in production again. Do you have any information on how to acquire one of these and how much one is? I don’t really use much effects (in fact the only thing I ever use is the built-in reverb of my amp) but this really sounds tempting. I don’t think you’ll get them here in Germany. Another great article Ingo – very nice playing too. I’ve got an Analogman Juicer which is yet another Orange Squeezer clone. I use it for just about all my clean sounds. It seems less subtle than what I’ve heard here. Sounds really squishy with the strat’s volume on 10, but closer to your sound if I back it off a bit. Another thing came to my mind yesterday. The problem of the distortion you’re talking about was one thing that also puzzled me always. Especially on the song Tunnel of Love. I always tried to sort of replicate that sound but never managed to do so. Now unfortnately I’m not an expert with guitars but the guitar he’s using on that song is a Schecter Strat (the sunburst one), right? And I always thought that since that is a Strat as well you should be able to get the same sort of sound (at least roughly) out of a Fender as well (I might be wrong there). Now that may only be my laymans opinion but in my ears the guitar on Tunnel of Love is very distorted (compared to Sultans of Swing for example). Now what I was wondering was: Is that due to different pickups the Schecter uses perhaps or is some sort of effect (something along the lines of what you discussed in your article?) or is it simply Knopflers techniques that gives the guitar this sort of distortion and makes it sing that much? Because as you say in your article, when I try to get that much distortion on my strat the single notes work fine but as soon as I’m playing more than one note it just sounds way to distorted. Due to my lack of knowledge I find it a bit hard to explain what I mean but I hope you understand it anway. I’ve used the analogman juicer but find the vintage MXR dyna comp better as it’s higher settings is less subtle and you get the pleasing and very useful fret board sounds/clicks/dymanics. You can get more compression but it’s different to say a Boss compressor CS-2 which I also use and love. For Down to the waterline and Sultans I use the MXR to drive(before) the BOSS and you get plenty of expressive compression, when you mix them. I have a strat with the vintage brass schecter pickup assembly like Mark used, the schecter pickups do have their own little dynamics going on and seem a little more rounded overall, but it depends on the body and neck as to what dynamics are getting amplified etc. Generally I find you can get that Tunnel of love play out tone using the middle pu. I think live he switched to bridge/middle after a few bars when it gets a little more intense (I think). The fills during the song I think are played quite loud in the studio so you are getting some breakup (slight distortion) due to that from the Music Man amps (probably). How about the Vintage Project Dan Armstrong Orange Crusher better? I heard about it but never tried it out. kompresör hava kurutucu lar? ekipman ve yedek parça vidal? kompresör servisi pistonlu kompresor servis ve hava kurutma cihazlar? hava tank? deposu ve sessiz hava kompresörleri ikinci el ve s?f?r da öncelikli marka 2 el jeneratör sizlere her zaman hizmet vermeye haz?r ekibimiz ile emrinizdeyiz..
Hi Ingo, I recently built my own OS and I love what it does to the sound. I was just wondering though if you knew what the preset (trim) pot adjusts. Tone, compression levels or something else? I haven’t made any adjustments to the preset myself yet. I always felt the trim pot has not too much of an effect. I think it sets an internal bias point. Simply turn it and see which setting you like best. I learned something about orange squeezer. But I don’t know about Mark Knopfler Guitar. Nick mentioned the Vintage Project Dan Armstrong Orange Crusher – I have one of these and can certainly recommend it – a very transparent and subtle compressor that appears to enhance and even out the sound in a good way that is not easy to explain! Very similar to the original OS however only a limited number were ever produced partly due to the death of Dan Armstrong (this was the last product DA had involvment in) and supply problems encountered by VTP. For real squish a boost pedal before the compressor is recommended – as demonstrated by Ingo in his blog. You really should compile a book with your collective study / research and thoughts! Along the lines of the `Stratocaster Chronicles` +CD coffee table book. beautiful work of this website and your guitar playing. help me Compressor – Orange Squeezer? God can apologize for the English language. To me the sound with a comp is not as good with the strat straight to my fender amp, while it is a true bypass (dan comp). It thins out a bit my tone and add treble.. So I don’t use it to get closer old Mark’s tone. I heard about it but never tried it out. kompresör.. Please find 3 links about the Orange Squeezer made by AnalogMan where you can find explanations in details by a man who knows what he is talkin’ about. I own the “Large BiComp” and i must say that it’s awesome. In fact the OS side is always on on my pedal board. Just a note of thanks for a thorough analysis of compressors and MK’s rig. I’m a guitar player who performed for over 30 years acoustically and have been exploring the electric guitar for the last ten. I’m enamored with MK’s sound and have had many questions as to how he achieved it. Thanks again for your amazing commitment to unravel what he does and has done over the years. I have one from the 70’s, and it still works. What is it worth? It makes a huge difference, if the Orange Squeezer is directly a the guitars output jack or at the amp side of the cable. In the first case, it decouples the guitar circuit from the cable, when it’s activated. The resonance frequency and amplitude go up, resulting in a much brighter sound. Ry Cooder used this before Mark Knopfler in 1980. I had one of these when I was 15 in 1978! It made my little rig sound so good. I even played it through a Pignose with a Big Muff. I have no memory of when I sold it or gave it away, but I always missed it. I got a BYOC version and am quite happy with it. Someone else built it.